Four years ago, my family left California for Washington DC. I can’t decide if I miss the mountains or the beaches the most. No, the Appalachian Mountains aren’t the same as the Sierra Nevadas. But in the past few years, I have found that the green, tree-covered peaks and pristine rivers of Appalachia can bring the same sense of joy and awe to my adventure-seeking soul as my mountains in California. A family vacation to West Virginia is one that every Mid-Atlantic family should take with their tweens and teens. 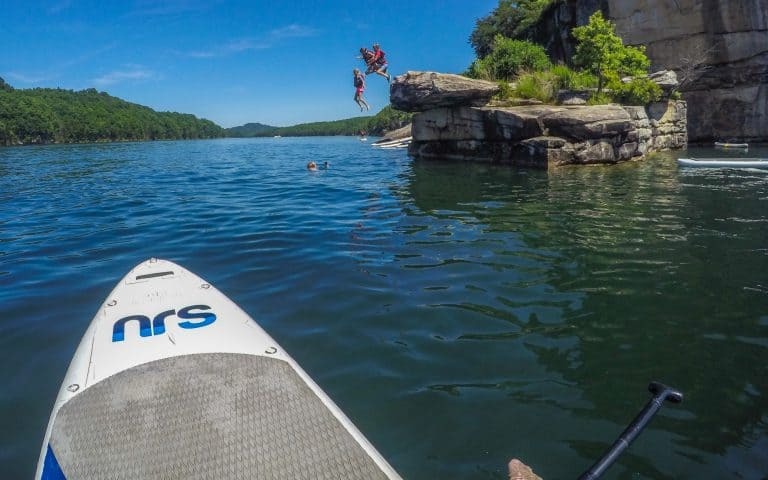 The Appalachian Mountains, Summersville Lake, and the New River offer many opportunities for outdoor adventure! 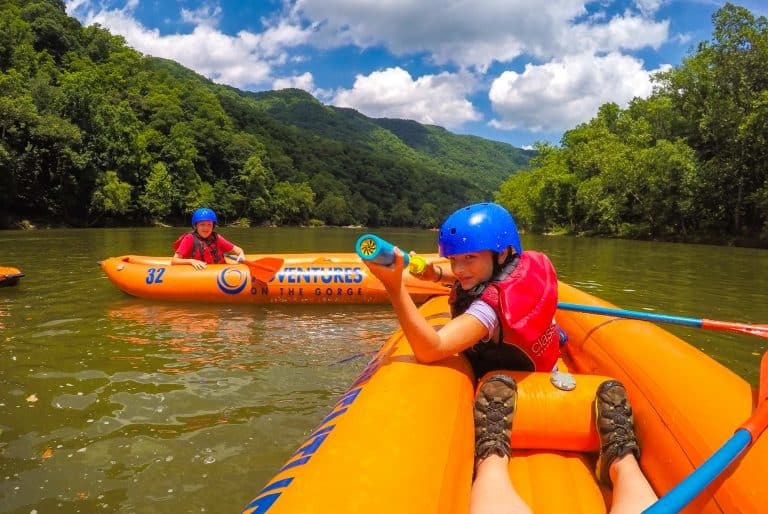 Stay at Adventures on the Gorge, an awesome West Virginia resort, and go New River rafting with kids. 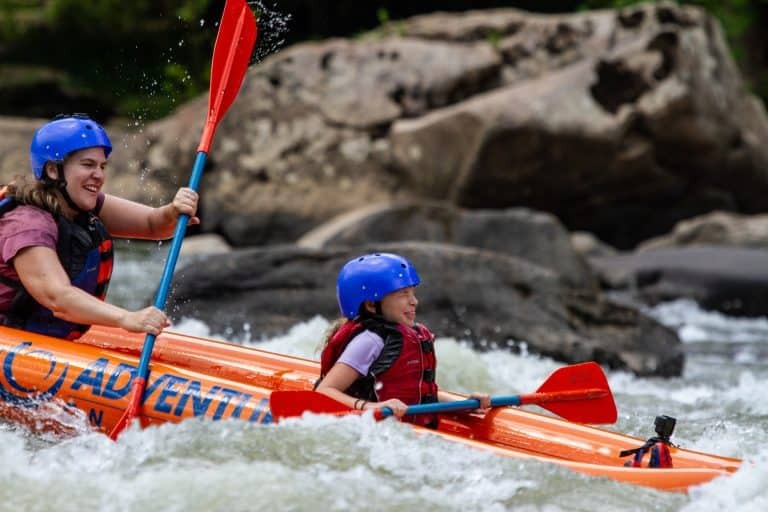 It’s certainly possible to piece together a New River Gorge National River family vacation, including New River rafting with the family, on your own. And, I’ve done it. We stayed at a motel in Fayetteville, hiked along the New River Gorge using the map that I picked up from the National Park Service Visitor Center, ate dinner in town, and visited Adventures on the Gorge one afternoon for some outdoor fun. With only one day spent along the New River Gorge in West Virginia, we left ready to return for more adventure at the first opportunity. 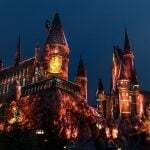 Want to make your Adventures on the Gorge vacation part of a West Virginia road trip from Washington DC? 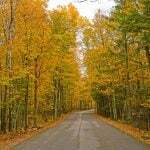 Check out Road Trip West Virginia’s Country Roads to the New River Gorge. 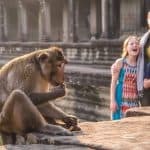 After my first experience, I have learned that it really is best to get expert help in planning a New River rafting family vacation in West Virginia. 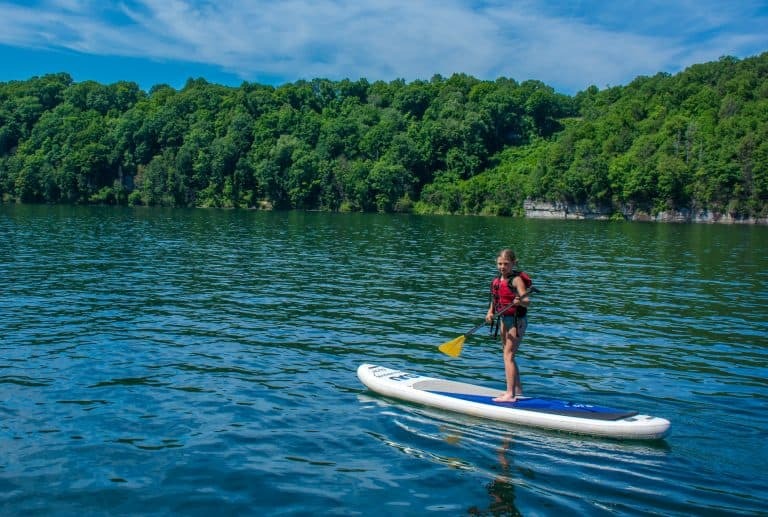 Adventures on the Gorge offers all sorts of packages for families. It is possible to get a feel for what is offered on their website, but giving them a call is really the way to go. Accommodations range for tent camping to cabins that can accommodate large family groups; you won’t find a lodge or hotel at Adventures on the Gorge, but there are hotel-like cabins. Each camp site and cabin has its own fire pit so families can bond around the campfire no matter which accommodations they chose. Also, Adventures on the Gorge offers many different family-friendly New River rafting trips dependent upon the season and water levels. Each New River rafting trip is different due to ever-changing river conditions. We enjoyed high water along the Upper New River with a group of 9-year-olds in two-person duckies in mid-June. 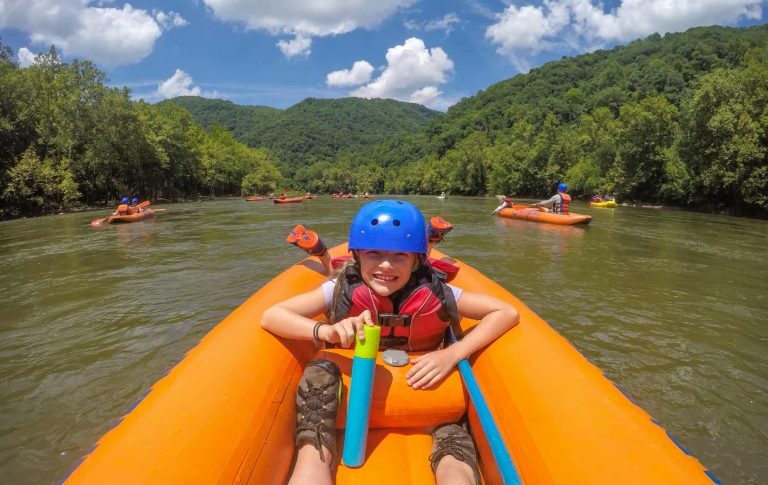 The conditions in August might allow for kids that age to raft part of the more adventurous Lower New River, West Virginia. The New River is actually one of the oldest rivers in the world, and it offers many different adventure options for families. Generally, there are two main options for rafting the New River, West Virginia. Families can raft the calmer Upper New River, highlighted by Class I-III water features, or the Lower New River, with Class IV-V rapids. During high water early in the season, families with kids under age 12 will be limited to the Upper New River for safety reasons. 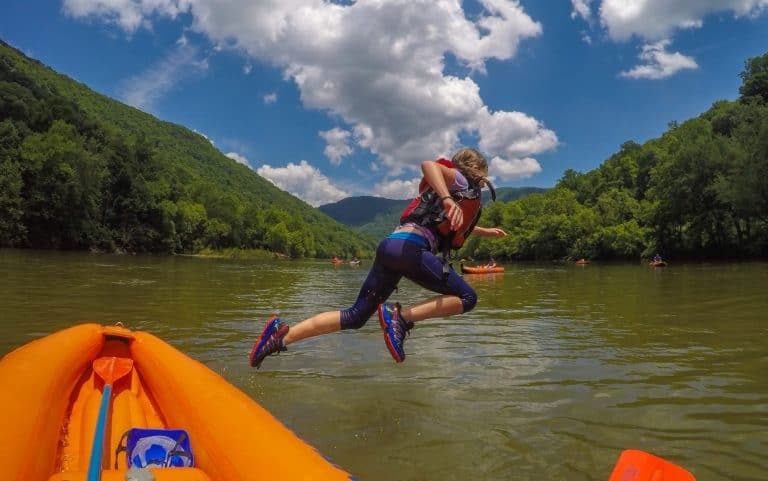 On the Upper New River, families will generally have the choice of rafting in a two-person kayak-like ducky or the more traditional 8-10-person raft. There are different West Virginia river rafting options for families as the season progresses though the summer months. My 9-year-old daughter and I chose to run the river together in a ducky. There were many advantages to our over-sized, two-person inflatable boat. First, our ducky was incredibly stable; not once did I feel like we would possibly fall out. However on the calmer parts of the river, my daughter could easily jump out of our ducky raft and be pulled back in with minimal effort on my part. Also, as we paddled we had a choice to how much whitewater we would experience. Being the adventure seeker that I am, I would most often paddle right towards the biggest, fluffiest, whitest waves, but I could have avoided them. In mid-June, our Upper New River rafting experience lasted most of the day. We returned to Adventures on the Gorge totally exhausted from our full day West Virginia river rafting fun. We did eat a full lunch along the river featuring make-your-own sandwiches, pasta salad, and cake. Everyone left the lunch stop pleasantly full, and some parents were even asking for the recipe for the yummy pasta salad. Yes, I wish that I could have also rafted the Lower New River in West Virginia. 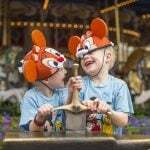 However, early in the summer it is simply not safe to take kids under 12 on that adventure. Due to its larger rapids, duckies are not an option for families rafting the Lower New River. All rafters must be in a boat with an experienced guide. The risk of falling out of the boat and taking a swim is much greater on the Lower New River with its class IV and V rapids. The Lower New is the section of the river that goes underneath the iconic New River Gorge Bridge. Created by the Summersville Dam half a century ago, Summersville Lake is now the largest lake in West Virginia. 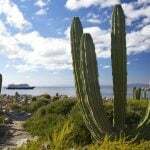 In the summertime it is also one of the most popular lake destinations for locals and tourists alike. 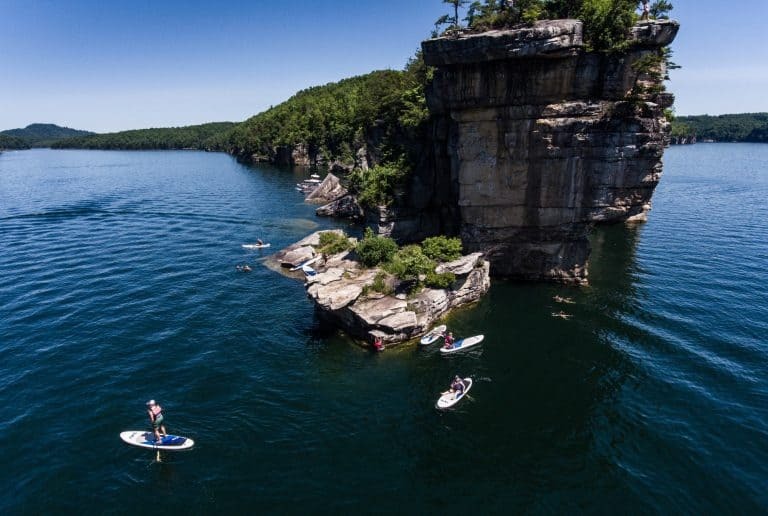 There’s good reason that this body of water is a favorite all over the state; its water is super clear and cliff sides rise right out of the water perfect for jumping and climbing. Adventures on the Gorge offers pontoon boat excursions on Summersville Lake for families and small groups. A hearty bag lunch and plentiful drinks are provided in the cost of the trip. The pontoon boat tour takes families to a few of the most scenic parts of Summersville Lake. 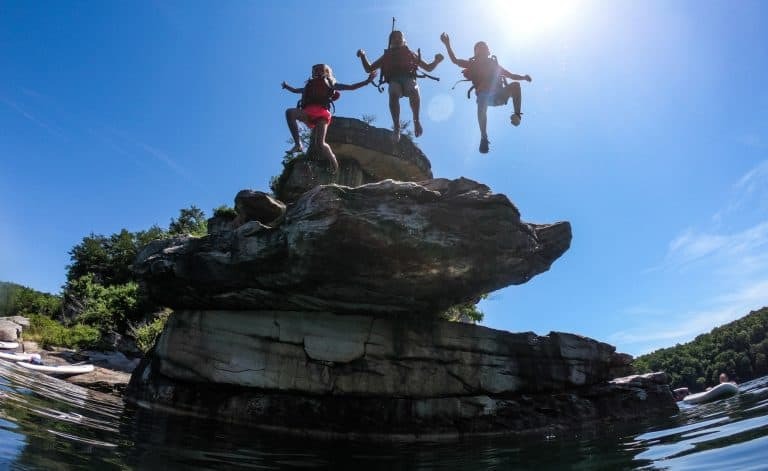 Often the excursions go to small a waterfall area with interesting rock climbing features as well as Long Point, where rocks jutting out of the cliffside make a diving board of sorts for some moderately thrilling cliff jumping. Families on the pontoon boats have access to paddle boards so that they can SUP and explore the lake. On the paddle boards adults and children can paddle beneath water falls and to rocks that are perfect for jumping. It’s so refreshing to cool off in the waters of Summersville Lake, which is not as chilly as one might expect (reaching 80 degrees in the peak of summer). For the more adventurous, there are opportunities for rock climbing directly from the pontoon boat. Due to the bridge’s design and the topography of the area, it’s difficult to see much of a view driving across the New River Gorge Bridge. However, when the bridge was constructed, it was constructed with a 2-foot wide catwalk underneath the bridge. 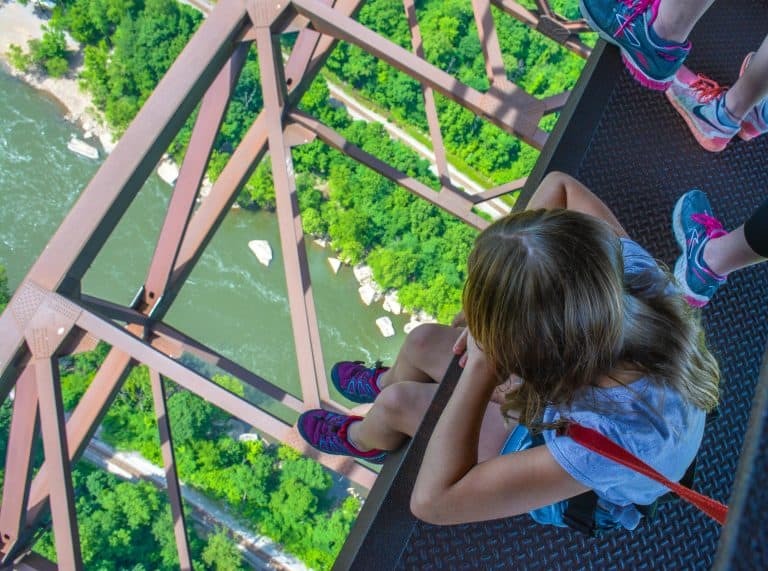 Now tourists and families can walk across the bridge on the catwalk to enjoy the views from almost 850 feet above the New River Gorge. The Bridge Walk is 1.25 miles long, and generally takes visitors ages 10 and up a couple of hours to complete. Bridge walkers are harnessed using a safety system that runs the entire length of the bridge during their entire Bridge Walk experience. While the harness system had me feeling totally safe and ready to hang my feet over the side of the bridge, many in our group felt that this experience was more thrilling (or terrifying) than our climbing and rappelling experience later in the day. As a photographer, I was fascinated by the angles of the bridge itself and the views from the bridge. I could have stayed up there all day photographing the white-water rafters below. The Bridge Walk was easily the highlight of my New River Gorge experience! The New River Gorge in West Virginia is nationally known rock climbing destination for avid climbers. I love that Adventures on the Gorge is able to put together half day and full day options for families to give this difficult sport a try with very knowledgeable and enthusiastic guides. While I honestly couldn’t get much more than 6-10 feet off the ground, I am so thankful that I had the opportunity to climb and rappel with my daughter. Every time my daughter has the opportunity to climb at a climbing gym, she conquers the most difficult beginners’ walls with seemingly no effort at all. 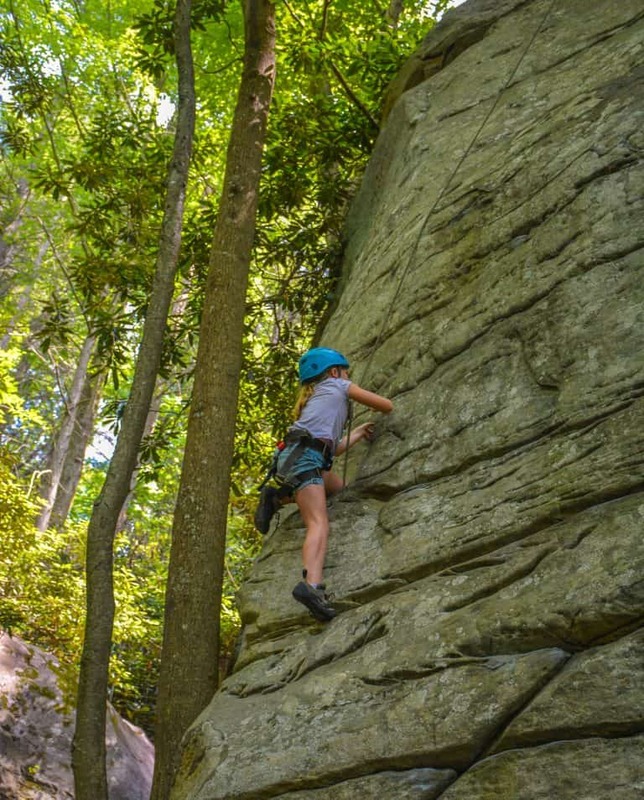 Adventures on the Gorge has rock climbing and rappelling opportunities for kids as young as 8 years old. So, I jumped at the chance to let her climb with the pros. Conquering the rock walls of the New River Gorge is not as simple scaling the walls of a climbing gym. However, I’m happy my daughter had the opportunity to give it a try with experienced guides. Even though she struggled a bit with arm reaches that were just a bit too much for her short 9-year-old arms, the guides encouraged her so that she left with a smile on her face. We rappelled in full view of the New River Gorge Bridge. It was so beautiful! Even though I hadn’t rappelled in twenty years, the guides walked me through the process. What an exhilarating experience! 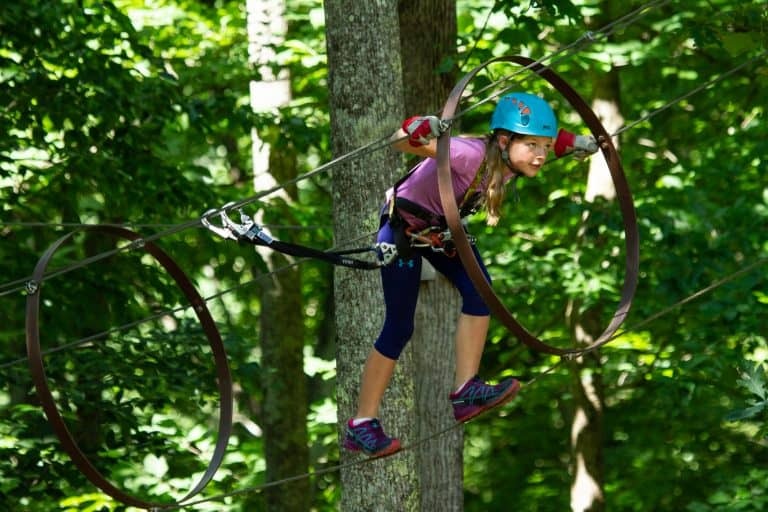 Adventures on the Gorge offers a few choices when it comes to adventures up in the trees. They have both a zip line course and an aerial adventure course. Children as young as 7 years old can climb with an adult on the TimberTrek course, a giant playground up in the sky. Do not discount this course as easy just because younger children can participate! My children claim this as their favorite aerial adventure course in the region for children ages 8 and under. It gets that distinction because it is the most challenging course that they have been allowed to conquer. Participants for the Treetops Zip Line course must weigh 90 pounds. Since neither of my children has reached that size yet, we haven’t been able to take on that challenge. 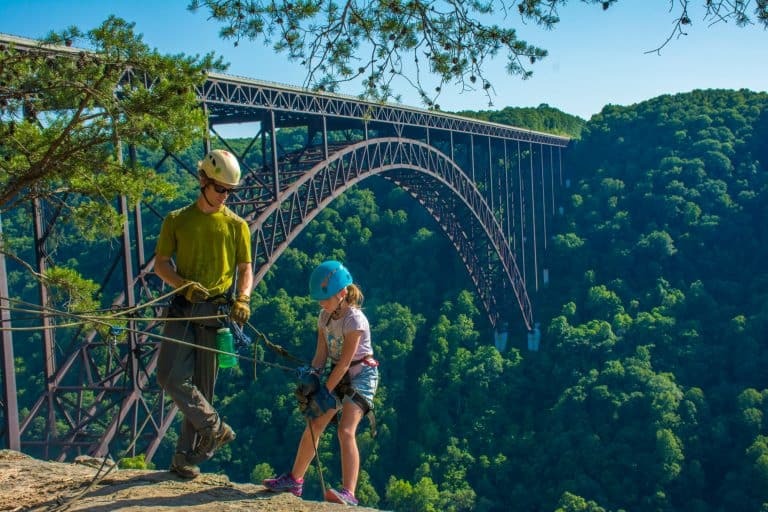 One thing that sets Adventures on the Gorge apart from its many competitors in the region is its beautiful location directly on the New River Gorge, within sight of the iconic New River Gorge Bridge. 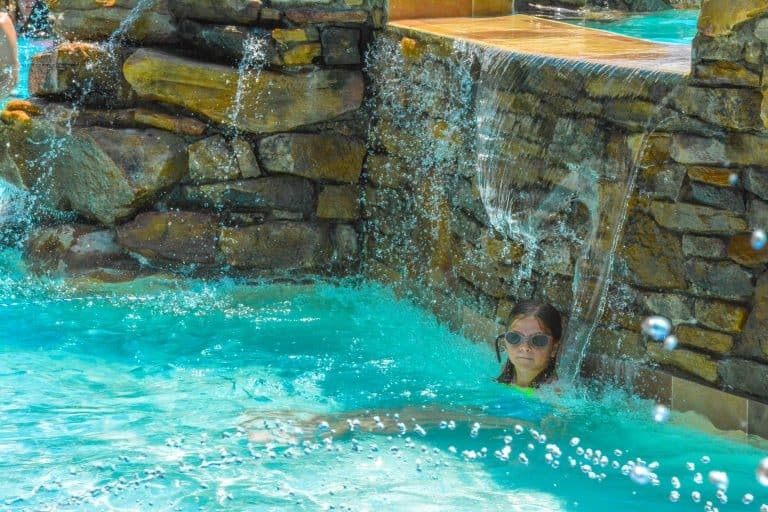 There’s nothing quite like sitting by the Canyon Falls swimming pool at sunset, watching the kids splash in the waterfalls and go down the tot-sized slide as the sun sets over the New River Gorge. The light on the New River Gorge Bridge in the hour before sunset is simply gorgeous. Options for lodging at Adventures on the Gorge are almost limitless. From traditional tent camping to luxury cottages with hot tubs, Adventures on the Gorge has it all. The only thing that you won’t find at Adventures on the Gorge is a lodge, motel, or hotel. During our visit to Adventures on the Gorge, we stayed in Kaymoor 4. 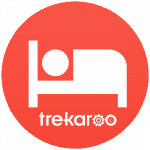 Kaymoor cabins have a bedroom with a king bed and a large living area with a pull-out couch, microwave, and fridge. They also have a bathroom. These cabins have beautiful wood paneling, are modeled after hotel suites, and are relatively new. 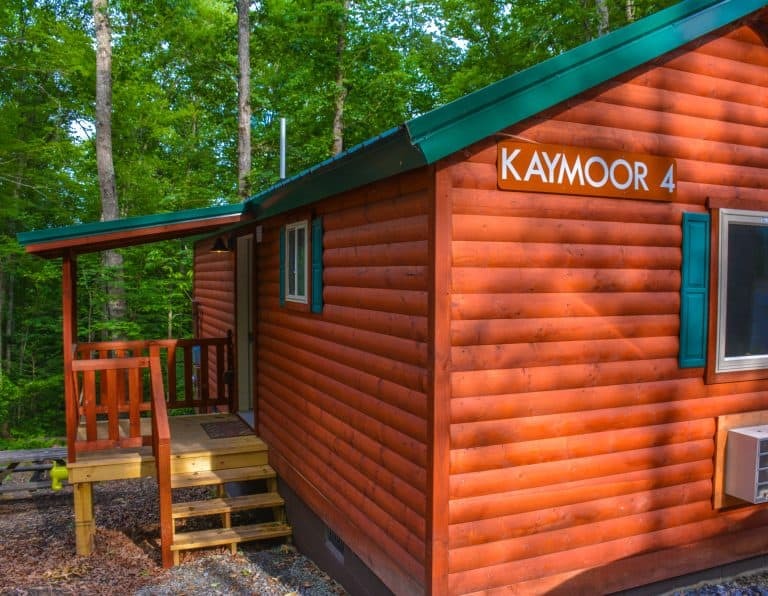 Overall, the Kaymoor cabins are a great choice for families. If we had only been staying for a couple nights, I likely would have chosen a Small Country Cabin for our family of four. The Country Cabins do not have their own bathroom, but they do have air conditioning. Sportsman Cabins are also a popular choice, especially for larger families. While there are many dining options out in town just a 5-10-minute drive away, you’ll be happy to know that Adventures on the Gorge has three family-friendly restaurants on property. It is possible to get breakfast, lunch, and dinner at Adventures on the Gorge. There are also popular meal packages available for your family vacation. Smokey’s Steakhouse offers a buffet breakfast option featuring some amazing sugary, glazed bacon with peppercorn. Hearty favorites such as eggs, biscuits and gravy, and sausage are often also on the menu. Smokey’s is within sight of the check-in area for many Adventures on the Gorge excursions. That makes it the perfect place to grab a good breakfast before a day of adventure. Smokey’s is also open at lunch and in the evenings as a slightly-more-upscale but still kid-friendly option offering full meals ordered off the menu or catered family-style for groups. Several meat-based entrees are available. (They can also be ordered to accommodate a vegetarian diet.) After sampling several entrees, my favorite was the Beer-Soaked Chicken with Parmesan Grits. Oh, those cheesy grits were amazing! My daughter loved the Cedar Plank Salmon. Enjoy dinner out on the patio within full view of the sun setting over the gorge to the west. 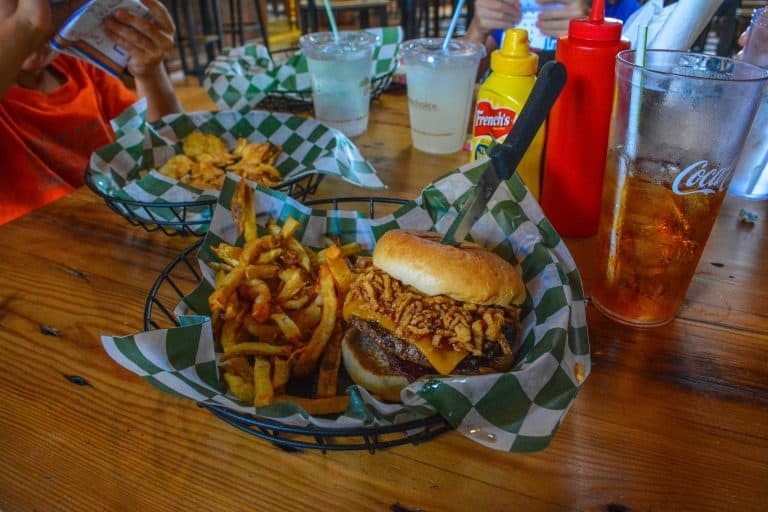 Chetty’s is a great option for families hungry for a burger or sandwich. It features indoor and outdoor seating. Our group of 9-year-olds ran off to the playground a couple hundred feet away as we waited for our food. The pizzeria is located near the cabins and campsites. Appetizers, salads, and pizzas are available for dine-in or take-out. Buffler’s is the perfect option for those who would like to eat at their campsite but are too lazy to cook for themselves (that’s me!). The children in our group totally devoured an order of pizza tots and mozzarella curds before the adults got a chance to sample them. 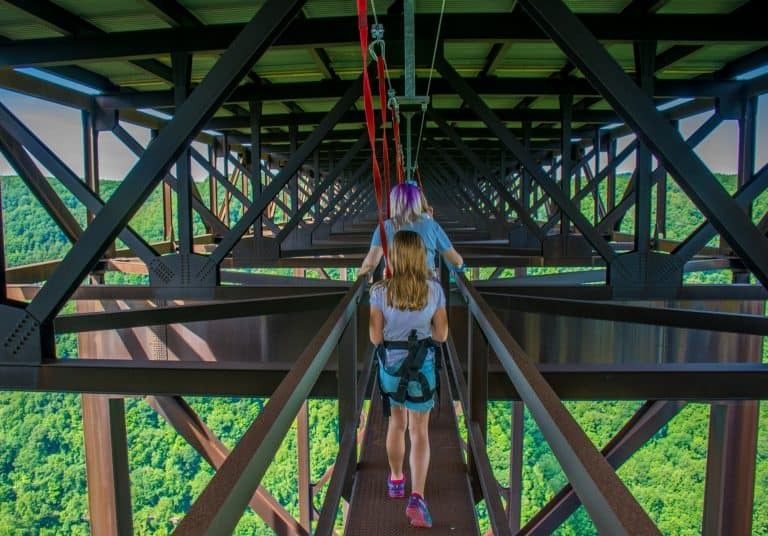 Disclosure: My daughter and I were hosted by Adventures on the Gorge on a press trip. All opinions are my own.